INCLUDES ONE 36'' CEILING SUPPORT WHICH CAN NOT BE CUT. If you need the shorter ceiling support, you need to purchase another ceiling support separately which may be cut to needed length, the Asin # is B01ABTYUIC. Shower curtain rod ships in three pieces. Includes 2 rods and 1 ceiling support. Simple assembly required. 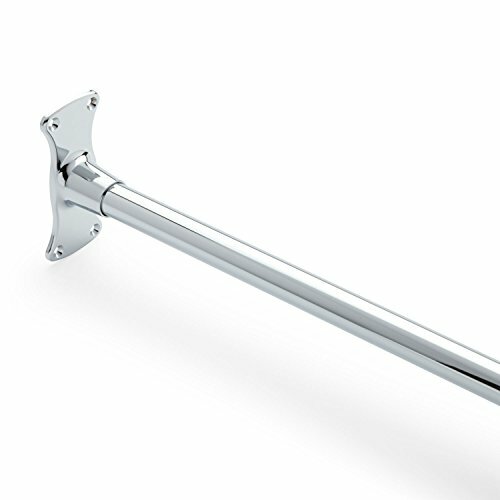 Includes rectangular Jumbo Rod Flanges and set screws, wall anchors and mounting screws. Rod can be cut to desired length. For best fit, order a shower curtain that is 6" - 12" wider than your shower rod. The rod was made of aluminum which will never get rust. If you have any questions about this product by Naiture, contact us by completing and submitting the form below. If you are looking for a specif part number, please include it with your message.